LBX HUNTER. LBX: LITTLE BATTLERS EXPERIENCE, LEVEL 2. SpruKits lets you build a poseable Batman from. The Dark Knight Rises. It has been eight years since Batman vanished into the night, turning in that instant, from hero to fugitive. But everything will change with the arrival of a cunning cat burglar with a mysterious agenda. Following the Suit's original designs, the shoulder cape and large range of motion allow this kit to fit into accurate poses and feature dynamic action! Bandai Model Kit. Dark Knight BATMAN. You will receive the following 1 Joker (87 pieces). 1 Batman the Dark Knight Rises (88 pieces). This kit contains 88 pieces and is of Batman from The Dark Knight Rises Movie. It is still sealed in its original box and has never been opened or used before. The item in the pictures is the actual item being sold so what you see is what you'll get. Batman - Arkham City. New condition in a sealed box. 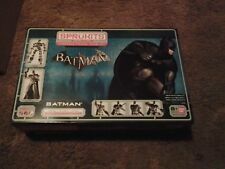 SPRUKITS Batman Arkham City Action Figure Model Kit - Level 3 - SEALED!!. Condition is New. Shipped with USPS Priority Mail. 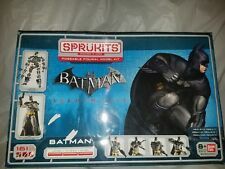 SPRUKITS BATMAN ARKHAM CITY LEVEL 3 (2014 BANDAI) - NEW!! BANDAI Eureka Seven Light Finding Terminus type R909 Model Kit 0134115 - NEW! NEW, but has a slightly crumpled box. The Level 2 kits easily snap together within an hour and, molded in separate colors, do not require paint to complete. Box and figure in pristine condition. Get it while it’s here! Never been taken out of the box. Brand New, factory sealed, great condition. Build Batman=Play with Batman Lots of small pieces and very difficult to assemble. Not for small children. Very detailed and comes with pictured accessories. SpruKits lets you build a poseable New 52 Batman from DC Comics. He’s a brilliant detective who’s mastered fighting techniques the world’s barely heard of. New 52 Batman. Millionaire Bruce Wayne was just a kid when he watched his parents get gunned down during a mugging in Gotham City. Does not contain paint or other modeling tools. YAMATO SERIES. (1994) BANDAI. SPACE CRUISER. The ready to assemble parts are mint, they look as if they have never been taken out of the box. The directions are also in great condition. Molded in separate colors, they don't require paint, and they easily snap together without need for glue. Choose from Batman (New 52), Batman (The Dark Knight Rises), The Joker (Classic Comics), or Superman (New 52). I am a special education teacher and another school year has started! Superhero Model Kit from Bandai Batman and The Joker. SpruKits lets you build a poseable New 52 Batman from DC Comics. Taken from BANDAI SpruKits page Millionaire Bruce Wayne was just a kid when he watched his parents get gunned down during a mugging in Gotham City. Don't just play, create with SpruKits! Create your hero from the ground up. These level 1 kits allow junior engineers and collectors to experience the joy of building as they snap together and assemble the various pieces to build their favourite characters. Realistic details and enhanced articulation allow you to position and display your completed Man of Steel Superman in a variety custom action poses. Don't just play, create with SpruKits! Create your hero from the ground up. What makes a hero?. Be sure to add us to yourfavorites list ! NEW IN BOX. DECALS STICKERS. RC ELECTRONICS. CAR WHEELS & TIRES. RC CAR BODIES. AXIAL UPGRADES. Hi. 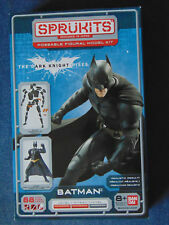 This is the very AWESOME Sprukits Batman from Arkham City video game. I built this for my own collection and I loved every minute putting this thing together. You can either paint it or not. The articulation is barnone. You won't be unhappy with this figure kit. Thank you for looking. Don't just play, create with SpruKits! Create your hero from the ground up. What makes a hero?. You are purchasing a Bandai Sprukits The Dark Knight Rises Batman Model Kit. All parts are sealed and included. THE BOX HAS SHELF WEAR/TAPING. 2014 Bandai Sprukits. No glue, paint or tools needed! Batman: The New 52.